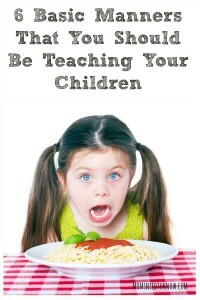 I Knew How To Be A Perfect Mom - Before I Had Children! 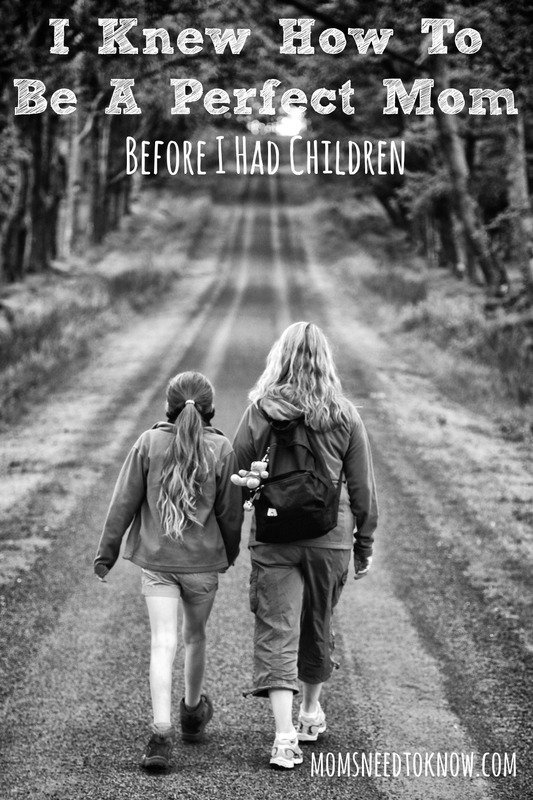 I Knew How To Be A Perfect Mom – Before I Had Children! Before we had children, most of us thought we knew how to be the perfect mom. It's often funny how quickly we realize how wrong we were! Let's face it. We all had those moments before we had children where we thought, “I can't believe parents let their children act that way!”. You may have seen a screaming child and thought there was no way your children would act that way. However, chances are you know better now. Let's take a closer look at how you may have known you would be a perfect mom, before you had children. I Wasn't Going to Put Up with That! Remember watching that screaming child in Target and rolling your eyes? While you are at it, try to work on this as well! How could that mom let her child act that way? There was no way MY future kids were going to act like that! Then it is 10 years later and you have a 2-year old and you haven't been able to get to the grocery store in a week. And unless you want to have cereal for dinner (again), you need to get through shopping. You are almost done when your little “angel” decides to have a meltdown. How many times have you pushed a cart around the store as your child screamed at the top of her lungs? Eventually, you learn to tune it out because you know that screaming at your child to shut up makes you look like an even worse parent than just ignoring her. You now know that you'd quickly go broke if you used this tactic every time you went shopping with kids in tow. Or you will create a monster of a child that knows that they just need to start acting up a bit to get what they want. 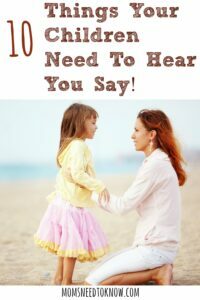 There are a few things that we may forget to tell our children, but they need to hear us say! We now know that the mom of a children having a meltdown is going through far more torture than you are for having to listen to it for 3 minutes. Sometimes you will be able to negotiate with a toddler. But sometimes you just have to “power through” and ride out the storm. Remember shows like “Nanny 911” and “Super Nanny”. They taught us that all you had to do was speak in calm, measured tones and say things like “I am very disappointed in the way you are acting” and your child would instantly change his or her behavior. I can't believe that I thought those shows had any basis in reality! Children are not all the same and not every trick is going to work on every child. Of course, you know that now, right? While these shows can sometimes offer great advice, kids are not foolproof. 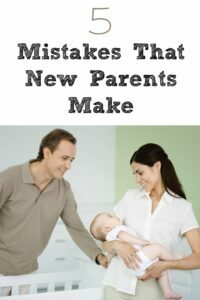 Be sure to check out my list of 5 Mistakes That New Parents Make! You may have also thought that you wouldn't be the parent screaming at your children in the grocery store – until you did just that. Before you had kids, you may have been a cool, laid back person – many parents were. That can all change when you're getting less than two hours of sleep each night and have a six-year-old, toddler, and newborn with you at the grocery store and one is leaving a trail of Cheerios while the other is screaming about wanting Doritos. Sooner or later, even the most “chill mom” is going to blow her stack. That doesn't make them a bad mom – just human. I had read tons of books, magazines and articles on parenting, breastfeeding, attachment parenting and co-sleeping. Nothing was going to stop me from being a pro at this! 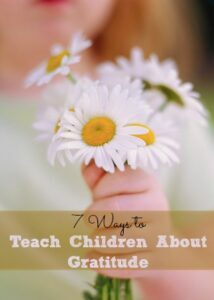 Like TV shows, all those will have advice that will work on some children, but not others. You probably thought you were well-equipped to handle everything – until you weren't. My Children Were Going To Eat Every Healthy Thing I Gave Them! They make it sound so simple…right? The books. online articles..heck – even the pediatrician tell you to just keep introducing the foods and eventually they would eat them. If you believe that is true for all children, let me tell you about this bridge I have for sale! That tactic may work with some children, but all I know is that my daughter ate about 7 different foods until just last year (she is 10). She would rather go to bed hungry than try something as simple as a baked chicken breast. There were many nights she DID go to bed hungry over her refusal to try new foods. It wasn't until she spent a week at Girl Scout camp that she finally decided to start trying more foods. It was probably something about only having 3 meal times a day and not have a kitchen to raid. The next time you see a young girl rolling her eyes at your parenting skills, just remember that you too once thought you'd be the perfect mom. Don't worry. Chances are she'll learn her lesson very soon. When did you realize that you knew nothing about being the “perfect mom” (if there is such a thing)?